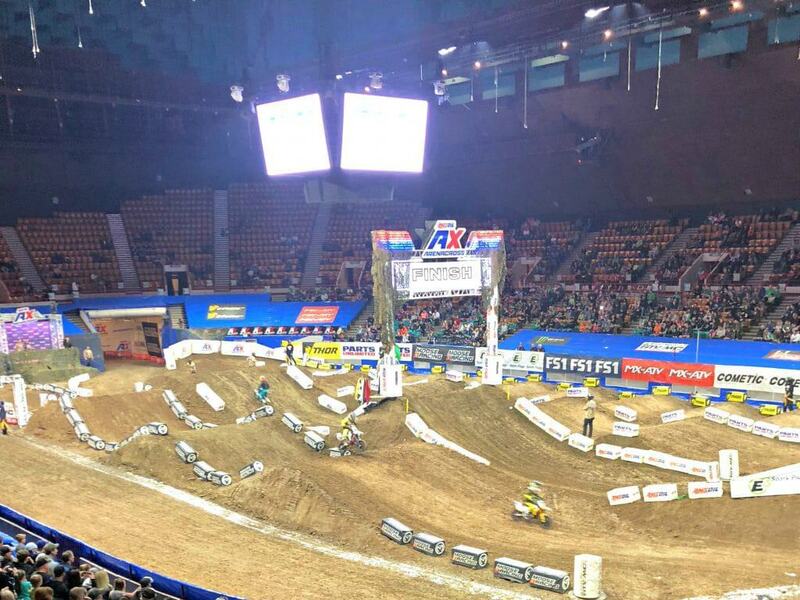 AMSoil Arenacross is coming to a city near you. Here is our experience. Disclosure: Our family was provided tickets. All opinions are my own. My son has been all boy from the minute he came into this world. He loves anything that goes fast, makes a mess and catches some air. When we heard Arenacross was coming to Denver, we had to get tickets because this was something he would absolutely want to see! 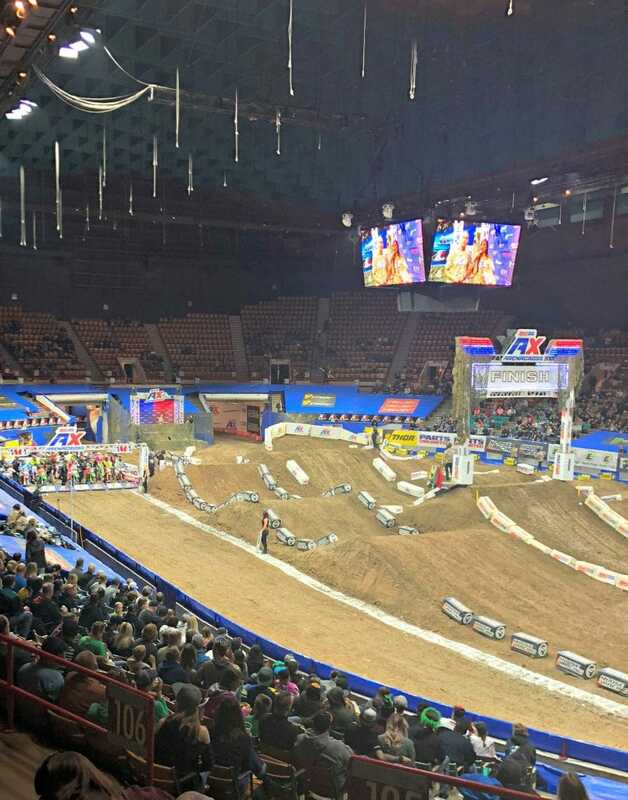 We were promised one of the most extreme racing environments with some fierce competition and that is just what we got with AMSoil Arenacross Denver! 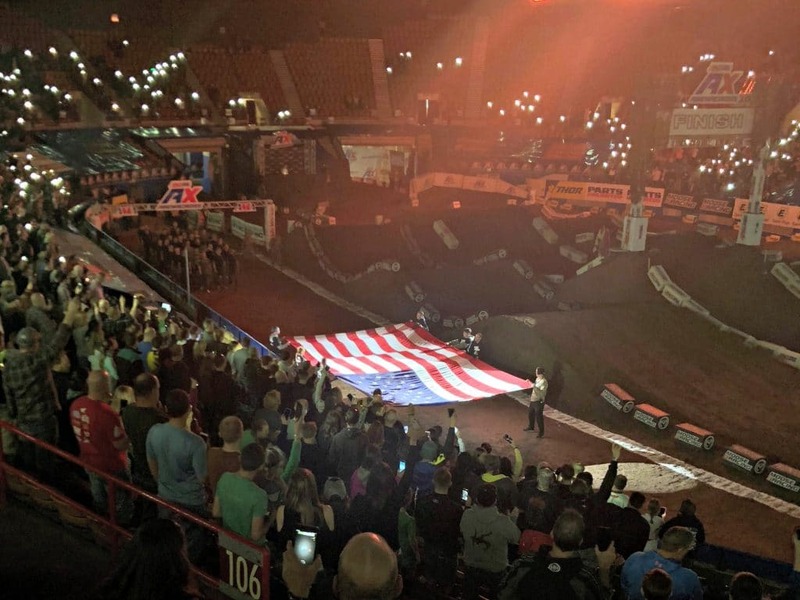 AMSoil Arenacross opens with a beautiful tribute to our country. I wanted to showcase this because not only did they have our flag presented well, but in the background of the photo you can also see a group of young men and women marching towards the flag. Once the National Anthem was finished, these brave young people took their oath of enlistment. It was really cool to see! Once the formalities ended, the racers lined up and the Denver Coliseum was insanity after that! The gates dropped and those racers were aggressive and skilled. They were wrecking all over the place and flying through the air off those jumps like it was nothing. The first lap out there was a massive pile up and they actually had to reset the race. So much excitement. One thing that I really liked was that between races, the announcers would host fun little races on the track, trivia in the crowd, throw shirts into the crowd and so much more. One of our favorite parts of the crowd fun was when they put 3 guys on tricycles and had them race around a small obstacle course. We laughed a little too hard at them peddling their hearts out trying to win that race! Super fun. 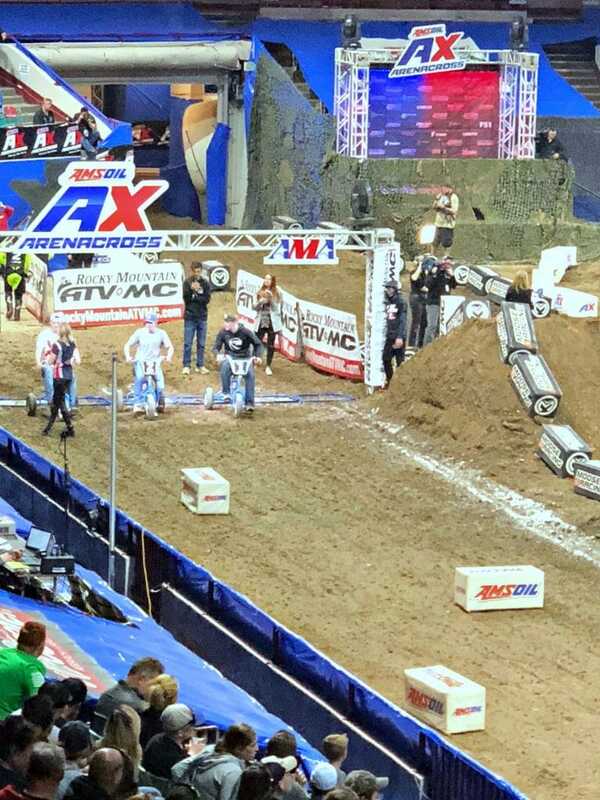 AMSoil Arenacross also did a really cool job of introducing the big names in the business with fun little videos that the racers definitely had a part in producing. If you are not familiar with who to watch or the sport trends, those videos were very helpful and made the races easier to follow because we knew who to watch and cheer for. 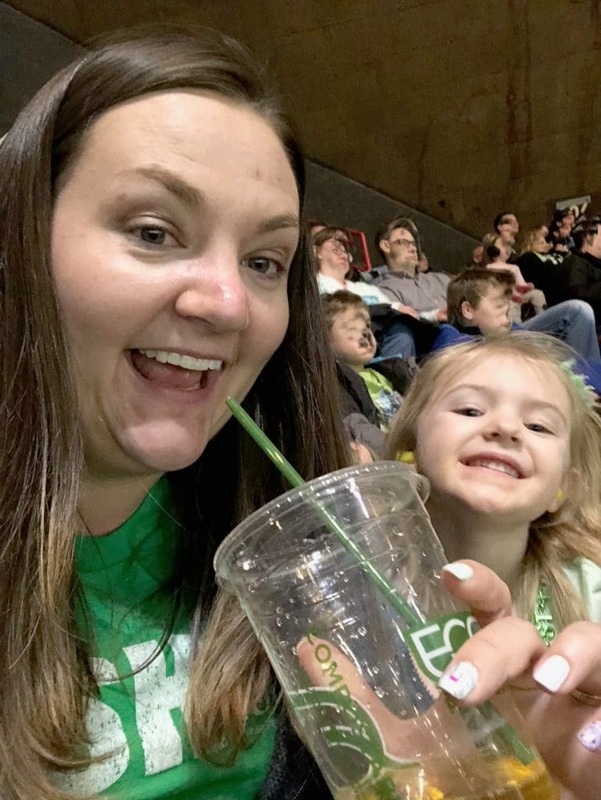 It was St. Patrick’s Day, so mama enjoyed a little spirit while we all cheered on our favorite racers. We truly had a great time. One thing that I would recommend for little ones is some ear protection. Those bikes can get a bit loud and with everyone cheering and the engines revving my kids were thankful for the ear plugs we brought. You can also buy them at the venue. 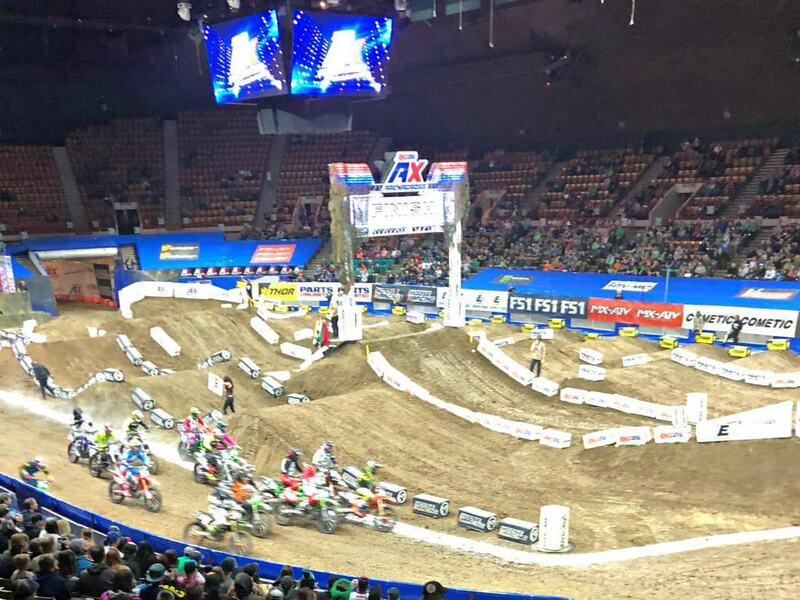 AMSoil Arenacross is a racing series, with races happening over 12 weekends and racers gaining points towards the championship at the end of the season. Denver is a hard fought battle due to the venue and the air and those racers were incredible. There are still 4 more stops on the Arenacross tour and so much fun to be had. Check out their website for more information and to purchase tickets! We ended our night a little early, after the itty bitty kiddos took to the track in the most adorable race I have seen. Our kids were exhausted, mama had enjoyed her evening and there was only one more race to go before we were going to be battling the crowds to get out of the parking lot. It was honestly one of the most fun evenings we had in a while and we are definitely planning to attend when it comes to town again. 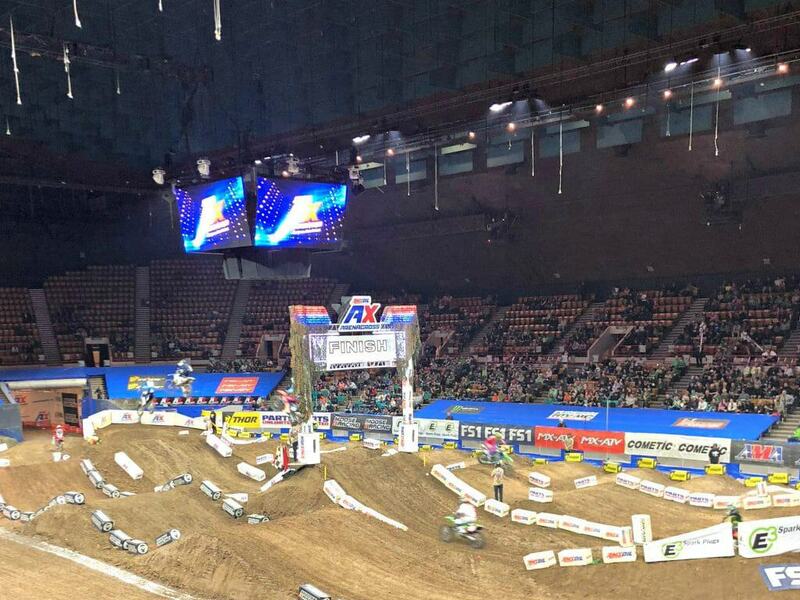 If AMSoil Arenacross is coming to a town near you, grab those tickets! 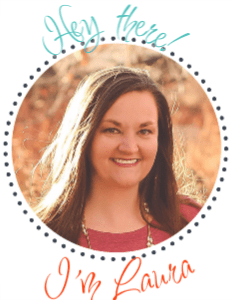 Previous Post: « Disney On Ice presents Frozen Comes to Denver this week!